Hilot is an ancient Filipino art of healing, commonly used today to relax stressed muscles. Hilot employ chiropractic manipulation and massage for the diagnosis and treatment of musculoligamentous and musculoskeletal ailments. They also have been known to reset dislocated and sprained joints such as the knee, ankle, fingers and metacarpal bones. The Philippines own brand of touch therapy, most widely known as hilot, is an old tradition. From its humble beginning in the countryside, it is earning international fame as the prestigious 2007 Asia Spa Awards recently recognized Mandala Spa & Villas Boracay’s Hilot Trilogy as “Holistic Treatment of the Year”. A study of alternative medicine in the Philippines is, inevitably, a study of the origins of its people and the amalgam of cultures and influences: Centuries of Spanish colonial rule and the indelible consequences of its religion, hundreds of years of trade with China and assimilation of its healing arts, tribal and provincial diversities with its profusion of folklore and mythologies, all redounding into the Filipino’s easy disposition for superstitions and the allure for the esoteric, mystical, and fringe. In the hierarchy of healers and specialists in Philippine folk medicine, the albularyo may be referred to as the “general practitioners,” specially versed in the use of medicinal herbs. The hilot ambiguously refers both to the Manghihilot and Magpapaanak. A Manghihilot is the term used in the Philippines for a person who specializes in healing muscular aches and pains by using massage. The Magpapaanak, besides prenatal visits and delivering babies, often performs the Suob ritual, (Suob is a ritual of postpartum care performed two to three weeks after childbirth). The albularyos and manghihilots are Filipino traditional healers in the communities who deliver health services. By tradition, they are the primary dispensers of health care. Historians and scholars had associated the Filipino traditional hilot therapy with the traditional Chinese medicine and the Ayurvedic traditional medicine. Some healers limit their practice of folkloric therapies to more specialized modalities. The mangluluop specializes in diagnostic techniques, usually referring the patients after diagnosis to the albularyo, medico, or manghihilot for definitive treatments. The medico is a further specialization, merging age-old folkloric modalities with ingredients of western medicine (prescription) medications, acupuncture, etc. Most of these healers consider their healing craft as God-given, a calling from a supernatural being, and consequently, their healing practices are profusely infused with prayers and religious rituals, performed through mediation with the Holy Spirit. Usually rural-based, they are also present in the urban and suburban communities, albeit in small scattered niches, serving alternative needs, the impoverished or the urban-transplanted rural folk. The principles of Hilot have been practiced in the Philippines for centuries, dating back to an era that predates the country’s written history. 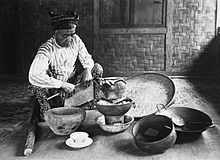 Although hilot is indigenously Filipino, it has traces of influence from the great medical traditions, that is, traditional Chinese medicine, India’s Ayur-Veda, and the Yunani-Tibb medical traditions of Persia and Greece. Hilot, This very old indigenous filipino massage and healing practice is a combination of different healing modalitites, that bring about changes in the body. It is a 3000 years old art of healing, and a part of the filipino culture and tradition that predates the coming of the spaniards and handed down from generation to generation. Hilot is a philosophy and a culture unlike the other types of massages it not only relieves stress but also has “a rejuvenating , healing effect” on the patient or client. a good Hilot practitioner would know the type of ailments his client is suffering from just by looking at him and sensing his energy. Hilot masahe is a common healing tool of Hilot that involves physical manipulation of skin muscle tissues and nerves that is healing, initiating, life-changing and operable therapy. Hilot is not just a simple massage but it is a holistic art and science that heals the person Physically, Mentally, Emotionally, Socially and Spiritually. Banyos – is a therapeutic bath that is washing of the body with water or with/through an herbal solution. The purpose of banyos is to cleanse, wash away dirt and soil (dead skin cells) in the body, and prevent the spread of bacteria causing diseases. Herbal Treatments – Herbs used by Hilot has been known as the early source of modern medicine now-a-days, that´s why having a Hilot Treatment is just like going back to basics of healthcare practices. Dagdagay – Traditional Filipino foot massage using two bamboo sticks. Dagdagay foot massage was usually done after foot banyos treatment. Bentusa, (cupping) – is a healthcare system used to restore balance of the four humors which is the blood, phlegm, yellow bile and the black bile. Philippine Traditional Hilot Massage is a holistic primary healthcare treatment modality that would benefit you in maintaining optimum health and wellness. Sawadee ka ! Welcome ! Experience the feeling of total relaxation, physical wellness and the enlivening of your senses. For thousands of years, the body’s pressure points have been employed in physical treatments in China, India and Egypt. Thai massage developed from these traditions. El masaje tailandés es un arte y una técnica que combina sabiamente conocimientos ancestrales para propiciar el bienestar y la sanación. Prueben la sensación de relajación pura, el bienestar del cuerpo y estimulación de los sentidos. The purpose of Thai massage is to bring the body, mind, and spirit into a state of balance and harmony, providing an opportunity for self-healing. The practitioner always begins the session with “Puja”, a moment of centering and connection, paying attention to Promwihan Sii, the Four States of Mind: loving kindness, compassion, vicarious joy, and equanimity. This practice helps therapist and receiver to enter a state of meditation, to be mindful of prana (energy and breathing), creating an empty vessel to receive healing energy and to achieve freedom from attachment. During Puja, the practitioner recognizes and asks for assistance from the lineage of teachers (God, Buddha, Dr. Jivaka, her own personal teacher). The practitioner checks in with herself to make sure she is okay with doing the session and with working with the person on her mat. She asks for healing for the receiver, herself, anyone else she knows who needs healing, the world and the earth. The benefits enjoyed from a Thai massage session may include the following: relief from stress, deep relaxation, warmed and stretched muscles, healing energy flow, greater flexibility, increased and focused energy levels, prevention of injury, relief from sore and aching muscles and joints, detoxification, and a feeling of confidence and well-being. This bodywork is perfect preparation for anyone in training for an athletic event, performance or any kind of physical or mental test. It helps one focus energy and attention on the task at hand. It is highly therapeutic for those in pain from tension, injury, or illness. 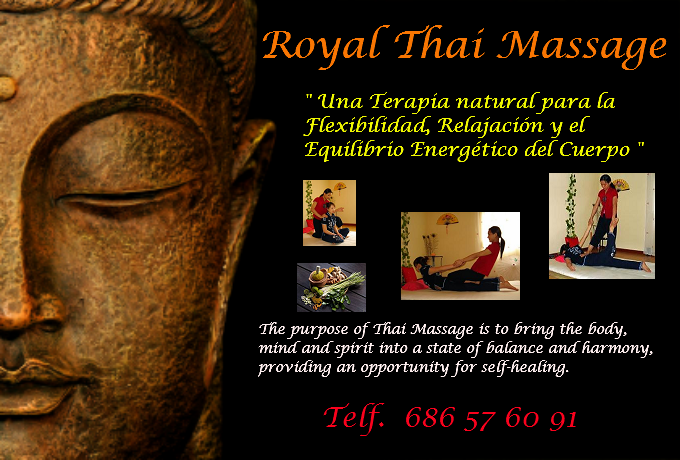 Thanks for your interest in traditional Thai massage. En Tailandia, los masajes se practican cotidiana y habitualmente a título preventivo y terapéutico. El masaje tailandés, que es sumamente completo, sintetiza en una las virtudes de diversas técnicas, (Medicina Ayurveda, Yoga, Medicina China). El Masaje Tradicional Tailandés es una forma única de terapia corporal que se remonta a los tiempos antiguos con más de 2.500 años de antiguedad. En su origen se practicaba en los templos de Tailandia por los monjes budistas como un medio para vigorizar y equilibrar mente, cuerpo y espíritu. Es una técnica de masaje muy avanzada y especialmente eficaz en el tratamiento de dolores dorsales, problemas circulatorios, dolores de cabeza, insomnio, angustia, cansancio generalizado, estrés, etc. A través del amasado de los músculos específicas de éste masaje, distiende y desanuda los bloqueos y las tensiones musculares. Otra técnica incluida en el protocolo de masaje tailandés es recurrir a la digitopuntura, la cual permite presionar puntos muy precisos de acupuntura y reequilibrar el Qi, es decir, la energía vital que habita en todos los seres humanos, (el sistema bioeléctrico de los seres vivientes). En la tradición oriental, toda enfermedad viene directamente asociada con un desequilibrio del Qi. Por último, los estiramientos inspirados en el hatha-yoga, el trabajo articulatorio y las manipulaciones del esqueleto mejoran la fluidez y la soltura del cuerpo. Al finalizar una sesión de masaje tailandés, todo queda de nuevo harmonizado y restituido, en su lugar. 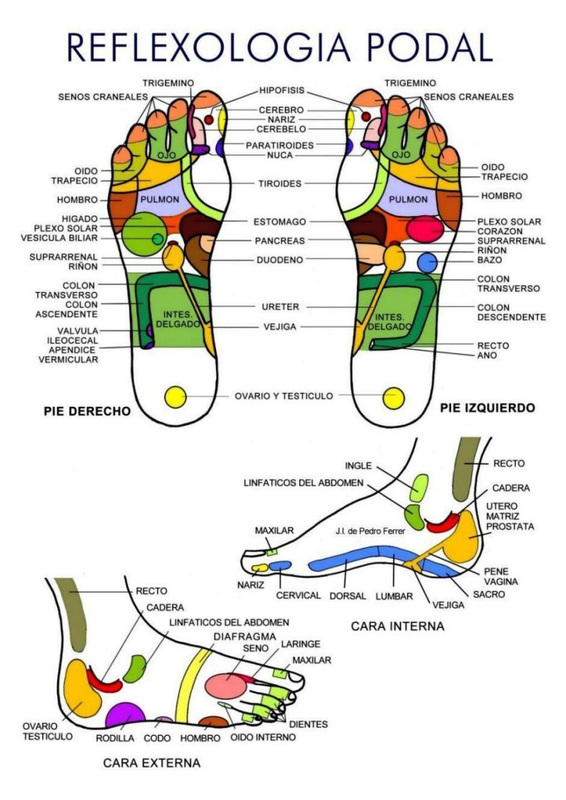 El masaje tailandés posee una muy amplia gama de técnicas y los profesionales trabajan desde un estado meditativo utilizando sus manos, pies, piernas, rodillas y codos para liberar la tensión mantenida y contenida dentro del cuerpo. Es una técnica de masaje sabia, muy completa y de una eficiencia asombrosa. Por algo se está extendiendo por occidente a gran velocidad y creciendo tanto la demanda como el número de terapéutas que lo imparten. El Masaje tailandés es adecuado para la mayoría de las personas de todas las edades, independientemente de su nivel de flexibilidad, dejando al cliente tanto emocional como físicamente profundamente relajado y lleno de energía, al mismo tiempo. 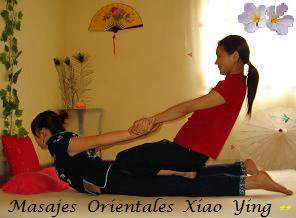 En Masajes Orientales Xiao Ying te ofrecemos la oportunidad de aprender esta fantástica terapia oriental además de poder disfrutar de tratamientos exclusivos y totalmente personalizados que incluyen el masaje tailandés. Ponte en las Manos de Oriente que Saben Cuidar. Asian hands you can trust. El motivo típico y principal para iniciarnos en el hábito de recibir masaje viene motivado, principalmente, por una situación estresante o dolorosa. Pero el buen masaje nos sorprende por ir mucho más allá, por ser mucho más profundo y ofrecer mucho más de lo que en principio se sospechaba podía aportarnos. El masaje regularmente recibido puede ser un gran beneficio para su salud y bienestar general. Siga leyendo para conocer algunos de los aspectos de una terapia maravillosa que pone a su disposición una mayor calidad de vida. El beneficio más obvio compartido por prácticamente todo el mundo es que un masaje de cuerpo completo te hace sentir muy bien! El alivio del estrés, la calma recobrada y la eliminación del dolor, son resultados más que suficientes para que muchos incluyan el masaje como una parte regular de su vida. Pero, ¿qué decir de los beneficios menos obvios? El primer sentido que se desarrolla es el sentido del tacto. No es de extrañar si tenemos en cuenta que cada centímetro cuadrado de la piel contiene aproximadamente 50 terminaciones nerviosas. Con un máximo de cinco millones de receptores en la piel… cuántos mensajes se pueden llegar a transmitir al cerebro ! La respuesta inicial del cuerpo ante un masaje es la rotura del ciclo del estrés y el relajamiento. Incluso un simple toque por parte del terapéuta se ha demostrado que puede reducir la presión arterial y la frecuencia cardiaca. El toque del masajista también puede ser la señal para que el cerebro produzca endorfinas, los supresores naturales del cuerpo ante el dolor y hormona que aporta felicidad. Profundizando aún más, el masaje puede restaurar la flexibilidad y la fuerza de los músculos, mejorando su funcionamiento general. Es el tratamiento ideal para liberar la tensión o espasmo de los músculos y ayuda a liberar toxinas, tales como el ácido láctico (producido por el tejido muscular durante el ejercicio). El funcionamiento del sistema circulatorio es vital para la salud. Su sangre y la linfa que nutren a los billones de células en todo el cuerpo y conducen los residuos para ser eliminados de las células. El masaje estimula un mejor intercambio de nutrientes a nivel celular y facilita una desintoxicación profunda. Recuerde que el futuro de su salud vendrá determinado por lo bien que su ejército de células se regeneran, por lo que esto es, de hecho, una parte fundamental para mantenerse saludable. El sistema nervioso es su red de comunicaciones, enviando mensajes de modo constante y determinando el buen funcionamiento en todo el cuerpo. El estrés puede afectar la capacidad del sistema nervioso para hacer su trabajo. Las numerosas terminaciones nerviosas en la piel y los músculos se calman mediante el masaje, lo que contribuye a mantener sus líneas internas de comunicación abiertas y en perfecto funcionamiento. El masaje también ayuda de un modo rotundo a mantener la flexibilidad de las articulaciones, como la rodilla, cadera, columna, hombros y cuello. Estas articulaciones son las vías por las que los nervios, venas y arterias pasan, por lo que su libertad de movimientos permitirá, o no, que la energía y la sangre fluyan correctamente y sin obstáculos. Por lo tanto, como se puede ver, el masaje hace bastante más que simplemente facilitar que usted se relaje y resolver las torceduras o un dolor de espalda. Dado que el masaje ha sido practicado durante miles de años y es uno de los primeros tratamientos conocidos por el hombre para preservar y favorecer la salud…, ¿por qué no escuchar más y mejor nuestras necesidades en la sociedad actual? De hecho, hoy el masaje está creciendo de modo exponencial en popularidad y reputación. En ocasiones, además de ser mal entendido, el masaje ha tenido que vencer las reticencias que muchas personas tienen con respecto al contacto físico. Por supuesto, una vez que la experiencia de un buen masaje terapéutico ha sido experimentada, la mayoría de las personas perciben la “realidad” y el cambio de opinión y actitud se produce… quedando totalmente enamoradas del, quizá, más ancestral de los tratamientos de la humanidad. Como puede ver, el masaje ofrece más beneficios de los imaginados y conocidos en un principio. ¿Será bueno entonces saber que algo que se siente tan grande puede contribuir a su salud a largo plazo? Vamos a trabajar juntos para ayudarle a sacar el máximo provecho de sus masajes, Nos vemos en su próxima cita!